Yes, it is already Day #13 here. We start early in order to take the month of December off…it makes for a much more enjoyable holiday season! It is already our 6th year of homeschooling too. Wow! I can hardly believe we’ve been doing it for six years! There have definately been “ups” and “downs” along the way, however some of the bumps are smoothing out as I figure out what works best for us and adapt. Bible – “Who is God? And Can I Really Know Him?”, Volume 1 of the “What We Believe” series written by John Hay and David Webb. I’ve tried various short bible studies and devotional books with the boys. We’ve also taken time to learn the books of the bible and just read bible stories, however the main goal in doing any of this is that they would grasp the concept of having a personal relationship with the Lord. My prayer is that they would not only have “head knowledge”, but mostly “heart knowledge” of the Lord, His grace-filled ways, and the purpose for their lives. Learning to see the world through a biblical viewpoint, rather than a worldly view, is something I was not taught at a young age. Hopefully doing this for my boys will save them many self-inflicted trials and point them toward service to others and to God. Lesson #1 and #2 have been very engaging so far. The boys seem to grasp what the book is teaching very well. It is written in plain, everyday language and includes activities and stories to which they can relate. On top of that, they keep a notebook for recording vocabulary words, insightful opinions and expressions about different topics, and memorize scripture each week. It was very encouraging once this past week to see my youngest have his first “A-Ha!” moment about satan and God. I am praying that God would use the material in this book and in our schooling to reach his heart in such a way that I have not been able to explain. So far, so good! Art – We’ll be doing various artsy type things. One book I found at a thrift store is “Exploring Textures in Watercolor” by Joye Moon. I will be painting right alongside the boys as we work our way through this book…..sort of a “perk” for me to be learning too, instead of just teaching! Texas History – We are using “The Story of Texas” by Harcourt Brace along with “Discover Texas”, a CD based history program. Also included in the plan are adding two smaller unit studies on Cowboys and Indians. Each of the boys will be making a list of all the places we study in Texas. Towards the end of the school year, they will be able to choose one place on the list to visit in person. “Hands-on” makes the best learning! This is a class easily combined for both grade levels. I think public schoolers in Texas usually do it in 4th grade, so in comparison, one of mine will be a year early and the other a year later than their peers. It saves me aLOT of time to be able to combine a few subjects. I just adjust the assignments and activities as needed for each grade level. Language Arts – Grammar “Easy Grammar” by Easy Grammar Systems, Scottsdale, Arizona We tested this last year and found it to truly be “easy”, yet still challenging. I love the way it teaches prepositions first so that the other parts of speech are more easily recognizable. Once you mark out the prepositional phrases first, it is easy to spot the subject and verb. Also, although both boys are doing separate grade levels in this curriculum, the chapters are arranged similarly so I can usually teach both at the same time. Language Arts – Writing This subject, I understand, is a common sore spot in every homeschooler’s plan. Even public school students and parents struggle with writing, mainly because they don’t do enough of it! (my opinion) Kids, especially elementary age kids, just. don’t. want. to. write! We’ve had many struggles with it. Although I love to write, trying to teach my boys to do it has been pretty difficult. Til this year, what we’ve tried to do did not have organization or depth. Now, we are trying a new curriculum shared by my friend that seems to be just what we needed. It will teach writing concepts at a self-paced/mastery plan and the same concepts will be used to build upon all the way through high school. Consistency in a long term plan seems the way to go in order for writing skills to be developed. It is the “Institute of Excellence in Writing” program. Language Arts – Spelling Last year, we used a spelling program that had lots of activities and colorful pages. It also seemed a bit expensive when paired with other homeschooling expenses we had. This year, I found a year’s list of grade appropriate spelling words online and decided to use it for free 🙂 The word list came from K12Reader.com. I simply printed the year’s lists of words, placed them in a folder, and then taped daily instructions on the front for spelling activities. Each day, the boys grab their folder, complete that day’s exercises, and by the end of the week are prepared for the graded test. Daily activities include reading the words to me, circling any unfamiliar words, writing the words, writing sentences with the words, using a dictionary to write definitions of words I preselect for vocabulary, and then taking a practice test. So far, this has been a no-nonsense, no cost path to greater spelling! Yay for free!! Language Arts – Reading I use LOTS of different materials to encourage reading success. One area of concentration this year is comprehension. Using an old Scott, Foresman reader, “Wheels and Rockets”, the boys are required to read certain stories and then answer the comprehension questions in complete sentences. We are working on changing a question into a complete statement and then answering the question. For example: “Why did the chicken cross the road?” Answer: “The chicken crossed the road because. it needed to get to the other side.” Rather than simply write “to get to the other side”, the boys are equating their answers to complete thoughts and proper speech. I also frequently require them to record the page number of where they found the answer by each question. This helps force them to look back at the story for correct information. Sometimes they do well, other times they confuse parts of the story, but we always talk through the answers and why something else might have been a better choice. We do lots of silent reading as well. They are required to read silently for a certain amount of time. Sometimes I assign the material to read. Sometimes they get to choose. Sometimes they choose at the library. Sometimes I let them choose from a preselected group of books I put together before the school year started. I try to have a variety of reading levels, books and magazines for them…anything to keep their interest! Language Arts – Handwriting I know, I know! This is a “lost Art” for many now a days. Call me “old school” if you want, but I still believe there is value in legible handwriting! Chances are that neither of my boys will be doctors, so I just assume that their boss will want to be able to read what they are writing, despite the Keyboard Age. To challenge them more, we also work on cursive writing! Doing cursive has actually made writing more exciting for them. They take greater pride in their assignments when forming the nicely slanted letters. This year, I’m not using any particular curriculum…..just notebook paper, starting with the ABC’s and moving towards mastery in connecting letters and words. Science – “Exploring Creation with Zoology 2: Swimming Creatures of the Fifth Day” by Jeannie K. Fulbright After years of using her curriculum, I cannot imagine going to anything different! Thankfully, she has written even High School level science curriculum that we can look forward to. So far, we’ve completed Astronomy, Anatomy, and Zoology 1: Flying Creatures. She also sells spiral bound notebooks that accompany the study and I highly recommend them. They are interesting, creative, and provide the perfect place to record the course’s observations and for use in note taking. Math – Teaching Textbooks This is a computerized math program that we started last year. It is a little behind the advanced curriculum we were using previously, however, it’s animated and fun for the boys to learn. It teaches, reinforces, quizzes, and challenges. It. even. GRADES! (Woo hoooooo! Oh how I loathe grading assignments, lol!) Anyway, I told the boys they could work at their pace (at least completing one grade level per year), but also can work ahead in order to stay challenged. We actually skipped a grade level for the youngest because the placement test he took showed he had already mastered 3rd grade concepts before this 3rd grade year had started. They love it! I love it! It’s a “win-win” math program that will take them well through any high school math requirements! 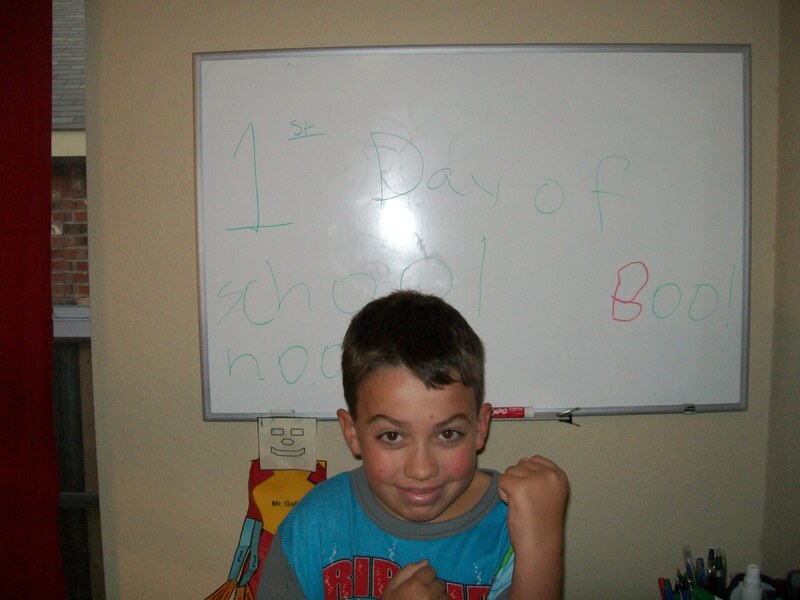 Study Skills – One of the things I have learned in homeschooling is that kids do not naturally know how to study! Discovering this has changed alot in our daily plan. Now, we learn about strategies for memorizing information. We engage in conversation to spark the sharing of ideas and higher level thinking. They use “Brain Pop”, an online program for learning new things and practicing test taking as well as multiple choice answering, etc. We do crosswords, map studies, dictionary work, and even play thought provoking games like chess and scrabble. I just usually try to have some type of study skill building activity each week to encourage them toward self-controlled, well-prepared, study habits. Other Co-op classes/activities – We will be meeting weekly with a dear group of friends who all homeschool. At last count, there were at least 40 kids participating, probably more. This will allow us the opportunity for more socialization as well as participating in group type classes. Co-op subjects we will be participating in are: Astronomy, Music, Citizenship, and US States. We are also joining the local 4-H club this year. Archery will be our main project but we look forward to learning more about raising animals as well as participating in other projects and community service events. Hmmmmm…..have I covered it all? It sounds like alot. Ok, actually it is, but thus is the challenge in homeschooling: attempting to expose our kids to the best education in order for them to be well-rounded, responsible individuals. I also believe homeschooling affords the greater opportunity to share Jesus with them in every area of life as well. If they can see Jesus in a math problem, then they are more likely to include Him in their thoughts and actions as they grow up. They will have a biblical worldview, as our bible curriculum calls it, and know the need and blessing for serving others. Each year, God seems to equip me with what we will need to make schooling successful, and for that, I am so thankful! To God be the glory, from me and for my sons who will hopefully one day surrender their all to Him. 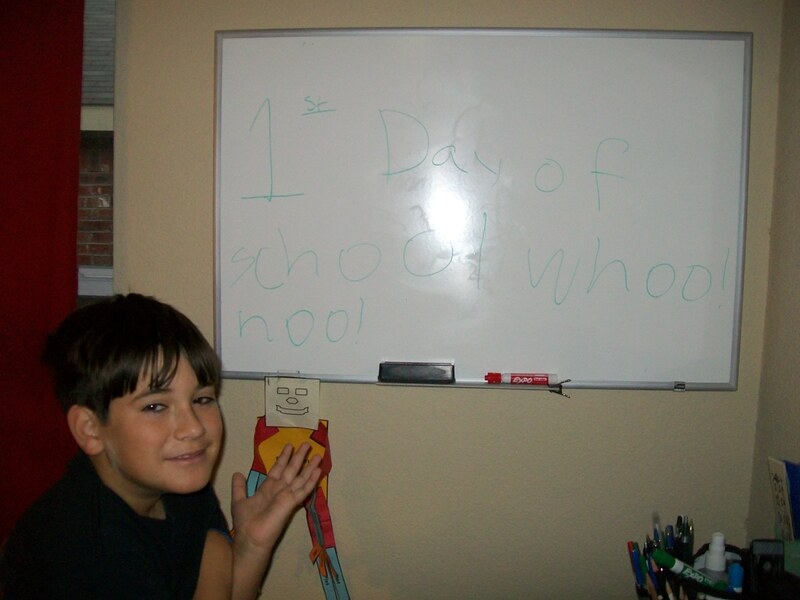 Just out of bed on the first day of school and he writes this message on the board. Now, if I could just convince them that starting back to school doesn’t HAVE to be bad, lol! Sorry, everyone, I haven’t opened Whatever Wednesday tonight. We’re heavily in prayer for baby Ella Ruth West who was born this morning. She has fluid in her lungs and possible pneumonia. Please join us in praying that her lungs will clear quickly, her breathing rate go to normal, and that she would be in her Mom and Dad’s loving arms soon. Parents, Stacy and Ron, are very blessed to have this new addition to their family! She is so precious and beautiful! — What a wonderful creation of God! Please pray for Josh Davis and his family. He was involved in a wreck while on vacation and needs a miracle today. He is Susan’s (Faithwalk) son-in-law. You can read more about it here. Wow. We really have a lot of obstacles to face right now. A recent turn of events has brought our Christmas cheer crashing down to a very low level. We’re trusting God to see us through, but would sure love some prayer support. Thanks, in advance, for lifting us up to the One who can “fix” it all.